Personal assistant (P.A.) services are available to eligible students with severe physical disabilities for daily activities, such as personal hygiene, lavatory needs, dining, and laundry. Services are provided on campus by trained ODS student employees. Each student's individual requirements and needs are assessed during the College Accommodation Plan Meeting. Personal assistance services are fee-based; the hourly rates for personal assistance is determined by the level of service required. Charges for individual care services are paid by the student or sponsoring agencies, such as the Bureau of Vocational Rehabilitation Services. Students who wish to employ personal assistants from an agency or an independent provider are welcome to do so. If private P.A.s require access to Wright State housing and facilities, the employee must apply through ODS for an affiliate Wright1 Card. The Personal Assistance Station (PA Station) is located in 072 Student Union. Equipped with three private restrooms and multiple lifts, the PA station is staffed by trained ODS student employees. The station provides assistance to students, faculty, staff, and guests with severe physical disabilities, at no cost to the consumer. The PA station is open seven days a week during academic terms (please inquire at ODS for specific hours), and provides personal assistance with lavatory needs, clothing, bags, etc. The PA Station staff does not provide medical treatment. For more information, see the Personal Assistance Station page. On-campus paratransit is a new accessible transport service offered by Parking & Transportation to provide students with disabilities door-to-door campus transportation. Two new accessible vans have been purchased expressly for this service. Eligible students with disabilities can set up standing/repeating or one-time rides with the paratransit service. Once registered, riders can set up their entire semester ride schedule or request one-time rides as needed (subject to request guidelines). Riders can also register their personal attendants to ride with them. Register with the Office of Disability Services. Meet with your ODS counselor to request a paratransit eligibility review. If approved, ODS will send notification of your eligibility to you and Parking & Transportation. Contact Parking & Transportation to set up your ride schedule. Campus shuttles run Monday through Friday when classes and finals are in session. There are no shuttle service during breaks, university-observed holidays or university weather/emergency closings. All shuttles are wheelchair accessible. There are several routes to access various campus locations. For route and schedule information, please visit the Parking and Transportation site. A campus parking pass is required to park in any university parking lot (except visitor lots). To park in accessible parking on campus, a disability parking placard or plates must be displayed along with a valid campus parking pass. Disability parking placard/plates are issued by the Ohio Bureau of Motor Vehicles. An application for disability placard is required, along with a prescription from a physician. For more information on campus parking, please visit the Parking and Transportation page. More information on accessible transportation can be found on the Resources page. 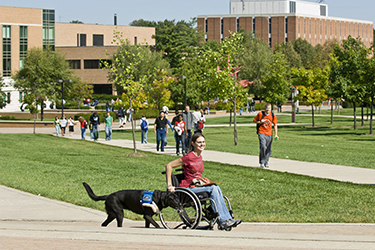 Nationally recognized for its commitment to students with disabilities, Wright State University was one of the first universities in the country to offer an on-campus dog park exclusively reserved for service dogs. For more information on the service dog park on campus, please see the Wingerd Service Dog Park page.